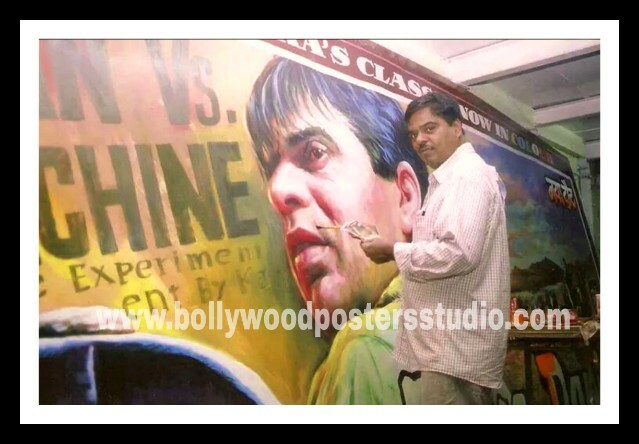 Indian Bollywood movie hand painted poster painters has contributed a lot for Indian Bollywood cinema. The most of the publicity and advertising was done by hand painted Indian Bollywood posters. The effects and looks of the posters were original no mixing no digital printing. These Indian Bollywood movie posters are 100% hand painted made by the makers of Indian Bollywood poster painter. Last few remaining artist are working to keep the dying art alive. These Indian Bollywood movie poster painters artist of Mumbai introduced the new art form once again to bring back the hand painted art through customizing Indian Bollywood movie poster. One of the most eye popping and interesting idea to add your photo on Bollywood poster. Now at Bollywood posters studio you can make your Bollywood type poster on oil canvas.